I’ve mentioned in previous blogs how spotty modernism was in American art in the early 1900s. Since the colonial period, American artists had a tenacious obsession with realism, including the work of portrait painters, Hudson River School artists, and Tromp l’oeil artists. However, by the end of the 1800s, there were a number of American artists living and working in Europe, many in Paris. This introduced Impressionism into American art, and by the late 1910s, experiments in modernism, including abstraction. 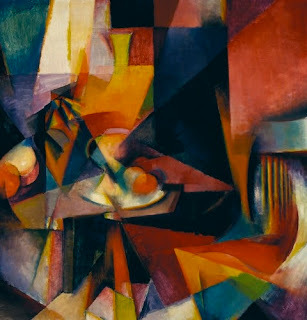 Although the Armory Show of 1913 is sometimes cited as the impetus for modernist impulses in American art (the show introduced Americans to Cubism and other forms of abstraction), many American painters and sculptors living in Paris were experimenting with abstraction before 1913. These artists were not only aware of experimental movements, but also participated in them. Many of these artists returned to New York and introduced modernism to Americans before the Armory Show. Fauvism, Cubism, and ultimately Dada/Surrealism and Futurism all had an impact on early American modernists. In my mind, the most interesting of these early American modernist movements by far was the style called Synchromism by its founders: Morgan Russell and Stanton MacDonald-Wright (1890–1973). 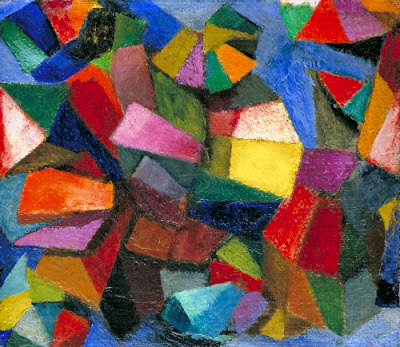 This movement, which evolved in the years before World War I (1914–1918), in its most literal translation means “with color.” It was informed by the light of Impressionism, the color of the Post-Impressionists such as Vincent van Gogh (1853–1890, Netherlands), and the scientific color theories of artists like Georges Seurat (1859–1891, France). Although the works of MacDonald-Wright and Russell may resemble works of Robert Delaunay’s (1885–1941, France) Orphism—a style that infused Cubism with brilliant color—Synchromism divorced color from physical objects to create pure abstraction. Russell initially studied sculpture, but under the influence of the Fauves he took up painting exclusively in 1911. MacDonald-Wright was heavily influenced by the late near-abstraction of Paul Cézanne (1839–1906, France). This work by Russell clearly shows the debt the Synchromist artists owed to Cubism. However, Russell has reasserted in his work the important connection between line and color to define forms. The two artists held an exhibit of their new style in 1913 in Munich, and then in 1914 in New York. By 1920 both artists had taken their color theories in different directions, including objective subject matter executed in the brilliant Synchromist palette. Studio activity: Russell, like Vasily Kandinsky (1866–1944, Russia), was very interested in the connection between music and abstract painting. Using pastels or colored chalks, create a work of abstract shapes in vibrant colors that symbolize the sounds heard in a piece of music. Remember that warm colors (such as red, orange, and yellow) tend to advance while cool colors (such as blue, green, and purple) tend to recede visually. This can help create a tension or movement in the music-inspired composition.